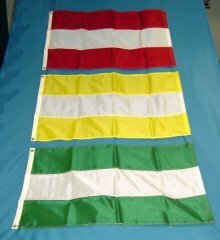 All attention color flags are manufactured in 100% nylon and include header and grommets. These items can be manufactured in a range of colors. Please refer to Nylon Colors to see what colors are available. Available at our e-Store. Available in packs of two, three, six and twelve flags. Available at our e-Store. Available in packs of three flags. Available in packs of three pennants. Available at our e-Store. Available in packs of three pennants. Available at our e-Store. Available in packs of 6 tall flags. are also available at our e-Store. feel free to contact us via email, phone, or fax. We can manufacture all of the following shapes in addition to what we offer at our e-Store. Contact us and we will quote you on your specific requirements. Priced as low as $8.00 each in random color 12 packs.